Honolulu, February 5, 1900, page 6. Elizabeth K. Freeth vs. Geo. D. Freeth. Honolulu, February 6, 1900, page 1. Manager Hayward of Waikiki Inn has just received a letter from Lenn B. Porter, "Albert Ross", who is now in Kandy, Ceylon. Mr. Porter says that his novel to be published in July 1900, will contain some reflections of his life and stay in Honolulu. Honolulu, March 9, 1900, page 6. MOANA HOTEL ... Location of Hotel. The location, situated immediately on the seashose at Waikiki, is Ideal and could not be improved upon, being at a point that faces the only place available for surf riding. This, with the unexcelled facilities that will be provided for sea bathing, cannot fail to render it especially attractive to local peoplo as well as to tourists, and it is safe to assert that every visitor will spend a portion of his or her time at the "Moana." These conditions, the promoters of the Moana Hotel Co., Ltd., believe, assure absolute certainty of financial success to the enterprise of erecting and operating a strictly modern and beach hotel. Many Clever Athletes Give Evidence Of Skill and Training in Manly Games. The second annual gymnasium exhibition of the Young Men's Christian Association waa held on Saturday evening in the presence of a large number of friends of the institution. The galleries in the gymnasium proper and the observation room were filled with enthusiastic people who cheered the athletes on in their efforts. The appearance and performances of the young people were surprises to many people, and much credit is due to A. J. Coats, the gymnasium director, for his interesting labors. The program was opened by a march of the athletes, who ranged from young men of experience with physical apparatus down to small boys just beginning their gymnasium work. Honolulu, April 27, 1900, page 7. The heavy northers expcrienced for several days this week resulted in such rough weather all along the coast that the local steamers suspended operations entirely on Tuesday and Wednesday and sought winter quarters in Hilo bay. Even here the surface of the water reminded one of a mill pond chiefly because it was so different. At high tide the lumber of the Hilo Mercantile Company on the makai side of the yard was threatened and a large force of laborers was employed for several hours in removing it to a place of safety. So heavy a sea is rarely experienced here and the wharves and water front were crowded with spectators during the afternoon of Wednesday. The old Hawaiian sport of surf-riding has become almost extinct of late in Hilo. During the high sea of the present week it has been revived to some extent, and on Thursday a considerable number of young Hawaiians were seen engaged In the favorite pastime of their ancestors. Honolulu, May 5, 1900, page 2. A very enjoyable surf riding party followed by a lunch was given at Waikiki last Sunday by Mr Canoe. The party was composed of the host and Mr Ka Steer rnui. The party declared the lime and gin served excellent. June 15, 1900, page 7. The beach was thronged with bathers yesterday afternoon and many surfing parties, spent the afternoon in canoes and on surf boards. Honolulu, July 7, 1900, page 1. Delegates Make Trip to Maine With Mr. Sewall. from press notices from time to time, have had a most successful and interestlng experience. Mr Manley the chairman of the Sub-Committee of the National Convention, had secured them rooms, also very good seats on the floor of the Convention, and provided tickets for Island friends who applied; among them being Mr. Mclnery, Mr. Bruner and young Mr. Freeth, who has an enviable position in Cramp's ship yard. Honolulu, July 16, 1900, page 4. It was an ideal day yesterday at Waikiki Bay for the young athletes, the surf was playfully vicious, over turning some of the more venture-some canoes and bringing forth manly strength and endurance to right them and bring them to port. At the Hotel Annex at least fifty surf boards were in play at one time while at other points a number of young men under the leadership of Sam Johnson and Itanior built pyramids, instituted water tournaments, leap frog, wrestling matches, and a hundred and one other entertainments for the amusement of the hundreds of guests and yet no accident happened. Even if there had been a United States life saving station on this island, it could have done nothing to help the young man who lost his life at Makapuu Point. The life saving station would most probably be located where there are the most people going into the water, viz: Waikiki. When the late Mr. Uhlbrecht lost his life, is a desolate, out of the way place seldom visited. But something should be done about the bathing and canoeing at Walkikl, or some of these days there will be an accident. Where people know how to swim there is little or no danger save in very rough weather, but strangers who don't know how to swim are constantly engaging the native canoes, and there is not a proper proportion of Hawaiian to passengers. Some years ago the writer was at Nilhau, a tremendous surf got up and yet It was necessary to get to the steamer. The wife and children of one of the proprietors had to embark. To each child, there were four, was alloted one Hawaiian, to the wife two. Each man had his surf board with him. The surf was run through all right, but had the boat upset each one of the family would have been looked-after and have been perfectly safe, while the crew looked after the boat. The vessel was a mile from shore, the six Nilhau men came onboard, had a feed of poi, and then diving over the vessel's side, merrily swam ashore again. The Star would suggest that two ladies and four Hawaiians should be the allotment In all canoe surf riding. It is by no means too much. Honolulu, July 18, 1900, page 7. At a meeting of members of lolani College on July 14th it was decided to publish a school paper called "The Ioiani College Magazine." It is hoped to have the first number ready by August 1st. The Magazine will be published at 5 cents and issued twice a quarter. J. Anderson has been appointed editor and Chang and G. D. Freeth sub-editors. Honolulu, July 30, 1900, page 9. The heat of the last two days drove all of Honolulu to Waikiki. The surf has been better than for months past, and those who know the art of board-riding have had a fill of it. Saturday and Sunday were gay scenes on the beach about the Hotel Annex. At one time over 150 heads were counted bobbing up and down serenely in the waves, and canoeing parties have been seen in greater numbers than for a long time. Oddly enough, there has been an inexplicable dearth of canoeing parties for some months past and the natives who live by the way of the paddle complain constantly of lack of patronage. Charley, the stalwart native whose figure is immortalized in a thousand kodak pictures, and who his posed for photographers and painters innumerable, has a big kick. He says, like Othello, his occupation is gone, and that what was once dollars were not rare from the pockets of tourists and artists, now quarters would be gladly welcomed. He says that folks prefer to lie in the sand and talk rather than enjoy the noblest sport that has survived the coming of the haole. Charley tells the story of the big tidal wave of some scores of years ago, memories of which were still fresh in his childhood, when a native rode a sixty-foot wave a quarter of a mile to shore and landed safe without ever splintering his board. Charley says that a dollar is not too much to pay for a canoe ride, and that if he charged less he wouldn't be able to keep the canoe in repair and his stomach filled with poi. Others, however, differ with Charley, and think that a half dollar charge for each passenger would make canoeing much more popular. Canoeing is gaining a foothold in embryo at Narragansett Pier and other Atlantic watering places. At the former resort the surfboard has come well into favor and the New York papers last summer commented freely and favorably upon the sport. The novelty was undoubtedly introduced by someone familiar with the Hawaiian surfing custom, who probably found the big rollers of the Atlantic Coast peculiarly adapted for rising upon their crests. Canoes were then talked of, and no doubt another season will find canoes of the Hawaiian type much in vogue at the swell watering resorts. Messrs Carter and Cooper are skilled in surf riding. They are athletes and produce an effective display to the eye. Honolulu, August 8, 1900, page 9. Left: Illustration signed R. Yardley, Waikiki, 1900.
serves greatly to enhance his comfort. What one sees at Waikiki may not all be told. The man who takes a bench on the beach and watches the thron (sic) in the water finds much to study. He is not ashamed of his flesh and gives lessons in unobtrusiveness to the dudes who stride the sands to show their shapes. The fat man is always at home in the waves. It always knows how to swim well, and once on the breaker his avoirdupois serves greatly to enhance his comfort. 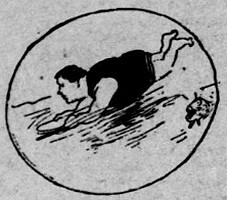 Who ever saw a skinny chap who could float like the 300-pounder who, serene upon his back, bids defiance to the buffets of the tides, and sleeps calmly half out of water? The artist has pictured the fat man, cigar and fan in hand, a bottle of soda floating near by attached to his belt, and the sea serpent looking on in admiration. The canoers, who, striped in black and red, make a big fuss of the launching of their craft and assure their ladies there is positively no danger in the sport while they are along, afford no end of fun to the onlookers. The fact is that the two or three natives who accompany the parties do all the work, and the natty gentlemen, who work with pen and ink during the week, are mere feeble paddlers who make motions for their sweethearts regard and impede the boat's progress but a trifle. The amateur on the surfboard is a funny sight. His frantic struggles to emulate the example of the old timer, who moves onto the beach ahead of the wave, are ludicrous indeed, and his pretensions to those ashore that he does not care to ride further than the few feet he does are nonsensical. The artist has portrayed faithfully the sights of the Waikiki resorts and only those who suffer by caricature will deny his art. Detailed illustrations by R. Yardley, Waikiki, 1900. Above: The fact is that the two or three natives do all the work. Left: The amateur on the surfboard is a funny sight. Volume 87, Number 85, 24 August 1900. THE "Hawaiian Islands" was the interesting subject of the sixth and last of the Burton Holmes series, given at the Columbia Theater yesterday afternoon. A larger audience than any that has yet attended this series turned out to hear the vivid and picturesque description of this late acquisition to the United States and wore wholly delighted with the treatment accorded the subject. If a lack may be noted it is in the scarcity of the volcano pictures, but for the rest— and Mr. Holmes was there during the annexation period— the splendid festivals of welcome to our soldiers, the coffee plantations, sugarcane districts, the delightful surf bathing (motion pictures), the picturesque natives and some excellent portraits of Princess Kaiulani — one a moving picture in the surf — a sufficient all-round notion of our new possessions was easily and delightfully acquired. The lecture will be repeated on Sunday evening. Salem, Oregon, August 28, 1900, page 2. "A Sugar Princess," by Albert Ross. Cloth bound $1. G. W. Dillingham Co..Publishers, New York. This is the 23d volume of the "Albatross Novels." It is a story of Honolulu and Japan, in which the daughter of a "Sugar King" succeeds in marrying the man of her choice in spite of the ambition of a purse-proud mother to connect the family through her with the European aristocracy. Carl Muller, the hero, is a sturdy type of rugged honesty, and well deserves the happiness that comes to him at last. Amy Van Steuben, the "Princess," is a loveable girl, wholly natural, the idol of her unspoiled, though millionaire, father. A vein of mystery which runs through the novel is satisfactorily cleared up at the close. Interesting descriptions of life in Japan and the Hawaiian Islands add to the readable quality of the tale and give it a brilliant setting. Perth, WA, Saturday 1 September 1900, page ? A PADRE IN THE PACIFIC. S.S. Moana, between Honolulu and 'Frisco. St. Peter's Day, June 29, 1900. We are having a truly Pacific passage across the shining sea, a passage which, in this swift boat, should last only seven days. My month in the Hawaii Islands, amid glories of flower and tree unsurpassable, is over-"vic transit gloria mundi"- but the memory remains, "the consecration and the poet's dream." I wanted to see Kilanea volcano, but the distance was great being 220 miles, the expense heavy, and the volcano has been quiescent for sixteen months. At intervals molten lava is belched forth. and rolls down the mountain side to the coast. Of course I went to Waikiki beach, and admired the long curled boats of the surf-riders. A tram took me out thither, and I sat between an Hawaian (sic) and a Chinee. How lovely the park is, with graceful needle-trees and bright eyed flowers. A crowd of natives was there in gay attire, picnicking andfeast ing. They sing their island songs, such as Aloho De! (ny love to you). Honolulu, September 10, 1900, page 8. This is a splendid opportunity for parties who enjoy surf riding. 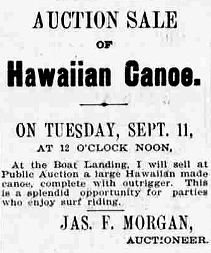 Honolulu, September 14, 1900, page 4. Honolulu, September 16, 1900, page 3. The bathing girl is a most attractive creature. Here she is in her glory, for here are so many devices just made for her pert coquetries. The surf board is not to be despised by her in this category and many are the charming poses she assumes in a vain endeavor to conquer the most difficult of sports. In her up to date bathing costume of black silk, and the most abbreviated skirt imaginable, and hair in picturesque confusion, with tiny sandals on her pretty feet, she is a creature to look at and adore. The swimming girl is an entirely different creature, just as attractive in her way. 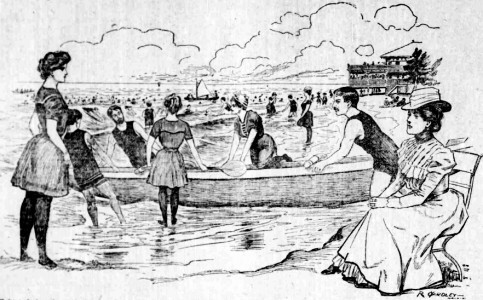 She does not wear a skirt to hamper the limbs, and if she does wear one before the eyes of the assembled multitude, she calmly takes it off before going into the water, for bathing to her is real work and not play. Her hair is securely confined under a rubber cap. If she is from afar hut our Honolulu lasses let their tresses fly to the breeze, and surely it is far prettier tho I doubt it being good for the hair. How hard it is for some people to swim! And yet one of the greatest swimming teachers said not long since: "Any girl can swim, learning if she can only overcome her fear of the water. Swimming ought to come as naturally to the human race as to animals, and it would if people weren't so awfully afraid of getting their feet wet. I can tell in a minute whether a person will ever swim or not by just watching the way he or she gets into the water. You know there are some people who go in by just putting a toe down and saying and taking it out again as if a crab had nipped it. Well, those people will never learn to swim, not even if they try all their lives. I know, because I've worked with them. I've tried coaxing, I've tried scolding, I have tried shaming them by pretending I despise cowardice, I've even tried heroic measures and abandoned them suddenly to their own resources in deep water. The first thing, open come their mouths down they go and they'd drown in simple panic if I didn't drag them out." That is probably the reason why some people can never, never be taught to swim. I notice children swim almost at once. You can make them jump off a diving board and they never sink. But you can never teach them to swim properly. They will always swim "dog-fashion" as long as they are children. When they grow up you can teach them the other strokes very easily. The little Hawallans are past masters in the art of swimming, and it is always a pleasure to watch the graceful movements in the water. Honolulu, October 12, 1900, page 4. Honolulu has won honors in Paris besides those mentioned in the Word comes from the exposition that in an exhibit of postal cards from all over the world the highest prizes were awarded to the two famous cards by Davey, the Honolulu photographer. 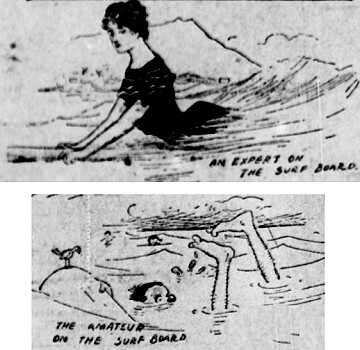 These were the pictures of surf riding and the lei women, which artistically colored and well printed adorn two of the designs ot cards sold by Davey. Honolulu, October 24, 1900, page 5. A fine surf board was found near the bell buoy this morning. See Wants column for further particulars. Honolulu, October 24, 1900, page 8. A fine surf board marked "B" was found near the Bell Buoy this morning. Full information can be had at this office by paying costs of advertisement. Note: This advertisement ran on the same page regularly for the next month. Honolulu, November 10, 1900, page 9. Catton's eleven beat Iolani College, 3-0. IoIani Coliege beat Catton's eleven, 4-1. Scotland beat Iolani College, 2-0. Iolani College ill put her old team into the field today. The opposition will consist of eight old players and three new hands at the game. The match should be very evenly contested and the winning margin gives promise of being smaller than match yet played. Iolani College: Goal, Freeth; backs, C. Willis, Ah Hun; halves, M. Andersen, Andrews, K. Fook; forwards. Smithies, Blackman, J. Andersen, Bolster, Len Qui. Referee, Rev. V. H. Kitcat. Honolulu, November 12, 1900, page 2. The Iolanis and Honolulus played football under Association Rules at Makiki on Saturday afternoon before an appreciative garnering. The -play proved of a very good order and the teams are rapidly showing better form and each encounter proves a distinct, advance over its predecessor. Freeth is improving but does not appear to know me game. Practice and determination will make a good player of him. Honolulu, November 19, 1900, page 10. Cosmopolitans Laid Out at Association Ball. The football match between the Caledonlans and Cosmopolitans was played under Association rules at Makiki Saturday afternoon. The contending teams were probably the strongest which could be brought together here, and the resulting game showed much advance over the preceding ones, both in combined and individual display. The play was fast throughout and at no time was the interest of the spectators allowed to flag. Final result: SCOTLAND, 4. COSMOPOLITANS, 1. Honolulu, November 24, 1900, page 9. The game will be played at Makiki. commencing at 4 o'clock. Iolani United: Goal, Ah Hun; backs, Willis' M. Anderson; halves, Blackman, Andrews, Kim Fook; forwards, Smithies, Bolster, J. Anderson, Freeth, Macfarlane. Honolulu, December 8, 1900, page 9. The game between Catten & Neil's eleven and the Honolulu Iron Works should also be closely fought. I predict a victory for the first named team by a narrow margin. Thursday 27 December 1900, page 5. Yesterday was a glorious seaside day, and the crowds at Coogee showed at any rate that its popularity was not on the wane. The children were paddling and surf-bathing to their hearts' content on the beach. The ladies' and gentlemen's swimming basins and the aquarium baths had more than their usual share of patrons in consequence of the warmth of the day. ... from town in the morning was hardly sufficient, and the engine-drivers had to whistle through a good many stopping places. Great Salt Lake City, December 22, 1900, Part 3, page 17.
needs to be fixed - Low priority , Probaly ficticious. Burtons Holmes' Hawaiian Presentation - San Francisco. Geoff Cater (2000-2016) : Newspapers : 1900.